With a 10,000-square-foot space, 30-foot ceilings and sturdy metal construction, the building Jasper Plumbing chose for its new home in Lindon, UT seemed to check all the boxes. Yet, despite appearing to offer everything the company was looking for, the sheer size and solid construction of the building meant cell phone signals from all major carriers failed to penetrate the walls, even with an AT&T cell tower located right outside. Jasper wasn’t alone. Business operations of the building’s two other office tenants were also disrupted by the lack of cell phone service. Losing valuable revenue to spotty cell phone service wasn’t an option, so Jasper Plumbing sought a cell phone signal booster solution from WilsonPro dealer BlueCable Networx. BlueCable Networx began its troubleshooting process by using a spectrum analyzer to identify the signal strength of the major carriers. Unfortunately, the results posed a potential problem: the proximity of the cell tower meant that boosting all carrier signals would cause the AT&T signal to overload the new equipment. The situation required a strategic approach. BlueCable decided to place the system’s rooftop donor antenna in a way that would boost signals from Verizon, T-Mobile and Sprint but shield the system’s equipment from the AT&T signal. With the rooftop antenna in place, BlueCable technicians installed repeating antennas and a booster to distribute the signal throughout the interior of the building. In just a single day, the cell phone signal booster increased reception in the building from 0 bars to 5 bars. The solution helped Jasper Plumbing and the building’s tenants maximize business operations and alleviate their connectivity issues. A WilsonPro passive distributed antenna systems (DAS) provides comprehensive cellular connectivity solutions in even the most unique environments. Contact BlueCable Networx, a WilsonPro reseller, to learn more about how a passive DAS can boost cellular connectivity for your business. 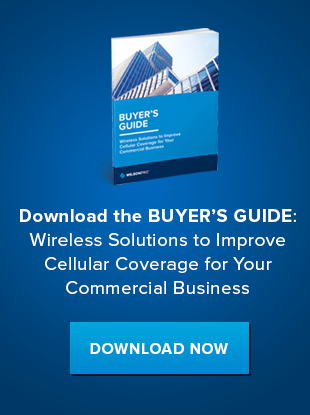 Or, download our Buyer's Guide to learn more about options for achieving optimal cellular connection despite building materials and geographic challenges.